Understanding that design and construction are just the first big steps in the achievement of your overall goals, we focus on doing it quickly and efficiently while viewing everything we do through the lenses of your best interests. We are committed to working with you in delivering extraordinarily successful project experiences according to whatever your schedule and cost needs are while maintaining the highest levels of organization, communication and quality workmanship. 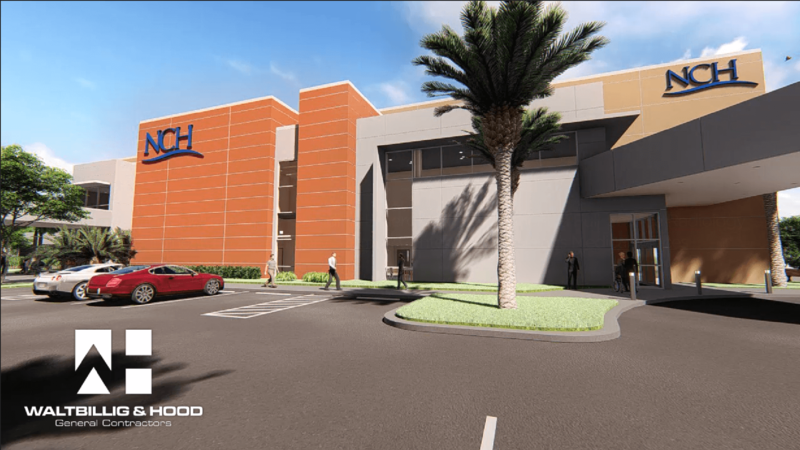 The 40,000+ square-foot facility will include a Freestanding Emergency Department, Ambulatory Surgery Center, full service Radiology Department and Physician’s Offices. Esplanade at Lakewood Ranch Wellness & Spa Center with Tiki Bar Café, Lagoon Pool, all surrounded by lush, tropical landscaping. Our team has extensive experience successfully completing multi-phased interior renovations, additions and ground-up healthcare projects. When working in an existing facility, we understand the importance of creating as little disruption as possible to your on-going operations and take great measures to ensure that your patients and staff experience the highest levels of safety, cleanliness and consideration in conjunction with our ability to deliver on time and under budget. We are well versed in and have successfully delivered many projects that fall under the jurisdiction of the Florida Agency for Healthcare Administration’s Office of Plans & Construction (AHCA). On any project, we believe strongly in the value that is created when a partnership is fostered and put to the owner’s advantage at the onset of the project concept. We believe in getting involved in the early stages and positively contributing to decisions that will ultimately affect your building’s initial construction cost, speed to market, function and maintenance needs. We have worked with Brian Hood and his team on multiple projects in the Healthcare field and we continue to benefit from having them involved on our projects. Waltbillig & Hood have served us well in providing excellent planning, scope development, budgeting, procurement and construction services. Their professional communication and leadership has always been valued in our organization, and helps to ensure a quality project and an overall positive experience. From their involvement in our initial concept discussions, through construction and move-in, Waltbillig & Hood’s total commitment to timeliness, detail, and budget oversight has been invaluable to our project successes. I am pleased to recommend their services, and welcome any inquiries as to their qualifications and strengths. It is with great honor and pleasure that I write this letter on behalf of Brian Hood, Michael Meadors, and Michael Gatley from the Waltbillig & Hood General Contractors team . As this was my first time building a commercial property, I was anxious about the process, which can be daunting. From the moment that Brian Hood and his team took on my project, I can say without any hesitation that I felt I was in the right hands. They were personally invested in my project and it showed throughout the process. Their goal was to deliver the high quality product that I expected, while guiding me through the process with my best interests at heart. There are many moving parts and challenges during any construction process, which have to be managed with skill and in an efficient manner. My particular project involved constructing a multi-tenant medical office building with outpatient surgical facility. My biggest concerns were staying within my budget, finishing on schedule, and building a top notch facility that I could be proud of for years to come. Brian and Mike embraced my goals and helped me realize them. They did so in a positive manner, were always receptive to any questions that I had, and they conducted business with poise and confidence. The team at Waltbillig & Hood will never take shortcuts or sacrifice the quality of construction. They take pride in their work, and especially in satisfying their client. I can say that unequivocally, I would choose them for any of my own future construction needs. There is no greater vote of confidence. I would be happy to discuss my experience with any individual who is considering these consummate professionals. I wanted to take the time to express to you how pleased I am with the performance and quality work that you and your company has provided for us. Working with your company has been a very positive experience. The quality of the work is outstanding. All aspects were handled with the utmost attention to detail. Throughout the entire project your staff was professional, responsive, cooperative and courteous to our needs. Your team made sure that the project stayed on schedule and as a result, our project was delivered on time, and within budget. Thank you again for all the hard work and for delivering a great project. I would highly recommend your company for any type of construction and I look forward to working with your team again. Vice President, Taylor Morrison of Florida, Inc.
As the Director of Facilities and Property manager for a large retirement community, including 48 single family homes, club house, 130 condominium suites, assisted living apartments and skilled nursing facilities totaling over 500,000 sq. ft . I am honored to recommend WALTBILLIG & HOOD, GENERAL CONTRACTORS. Results oriented, developed proven skills in the following ; excellent planning , scope development, project management , professional communicators from permitting to final certificate of occupancy. W&H are experienced leaders in all areas of highly regulated types of healthcare construction including AHCA and TJC. I would recommend WALTBILLIG & HOOD for any project large or small, they truly inspire and deliver. We have worked with Brian Hood for many years on various projects, mostly in the Healthcare field. Recently we completed a project with him and his firm, Waltbillig & Hood. We were impressed with the timeliness, attention to detail and total commitment to respecting the client’s desire to continue serving patients in the adjoining space with minimal disruption. We would be pleased to work with again on any project.